I would like to introduce you to my latest scarf pattern, the Chinois Scarf. 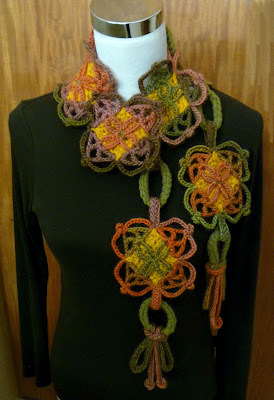 This design was inspired by my love of using chunky yarn in a delicate way. I love the juxtaposition of the strong chain links with the lacy motifs. I think it creates balance in a unique way. 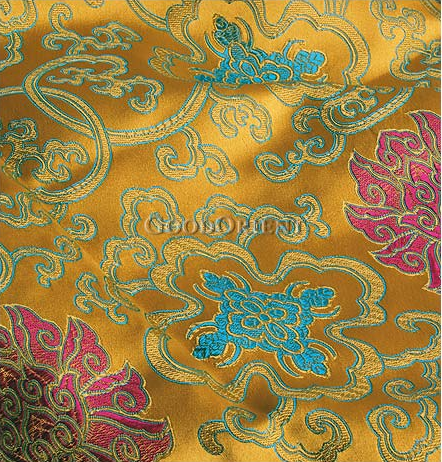 I named it the Chinois Scarf, because it reminds me of beautiful Chinese silk fabrics like the one pictured below. I learned a very important design lesson with this scarf. Always wear your creations in an everyday setting to test them out, and see where any improvements can be made. I wore this scarf to pick up my daughter from school one windy day, and I found out that the motifs needed to be reversible, so the scarf can move with you and look great at all times! So I devised a way to make the motifs look virtually the same on both sides. It is a great project for that beautiful variegated yarn you have been saving or wanting to buy! A stitch diagram for the motif is included in the pattern, along with the written instructions to make the pattern as clear as possible. If you would like to purchase the pattern, it is available as a pdf download for $3.95. In honor of the release of this pattern, I would like to give a copy away. To enter to win, please leave a comment on this post, and the winner will be chosen randomly. Entries will be accepted for one week, and I will announce the winner next Friday (March 16th)! It looks gorgeous!!! Congratulations....curiously, I just finished a necklace last night and wore it today for work, just to check if it would work!!!! and it did! Thanks for sharing and congratulations again! O.K., that is way too cool. What a beautiful job you need both designing the pattern and working it up. Please enter me in your contest. 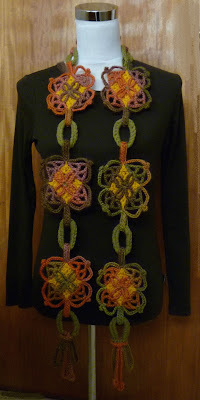 What an awesome pattern - please enter me in your contest. Oooh how awesome! Count me in! Pretty! I love that you used chunky yarn but still have a delicate scarf. Please enter me in your contest. I'm going to begin following your blog, too. I love the motif you used in this scarf! This looks more like a piece of jewelry than a scarf. How beautiful! What a unique design. I would love to make one for my Grand-daughter! Please enter me in your contest to win the pattern. Thanks! Absolutely incredible... what an amazing talent and eye for color. Just beautiful. Beautiful scarf. I craft items to donate to various organizations as fundraisers. This would be a fantastic scarf for such a purpose. I hope I win! Thank you for this post. Love love love! The chinese theme is just gorgeous. If I don't win the pattern, I just might have to give in and buy it, hehe. Thanks for sharing! This is gorgeous! You have great imagination! Beautiful workmanship. Love the scarf. I might have to purchase this pattern. I am always looking for new and interesting ideas for crocheting. May you crochet many more beautiful things. I am totally in love with your blog. Thanks for sharing your beautiful projects and awesome talent. I was so excited to find it today via the Crochet Tour. You're a genius! 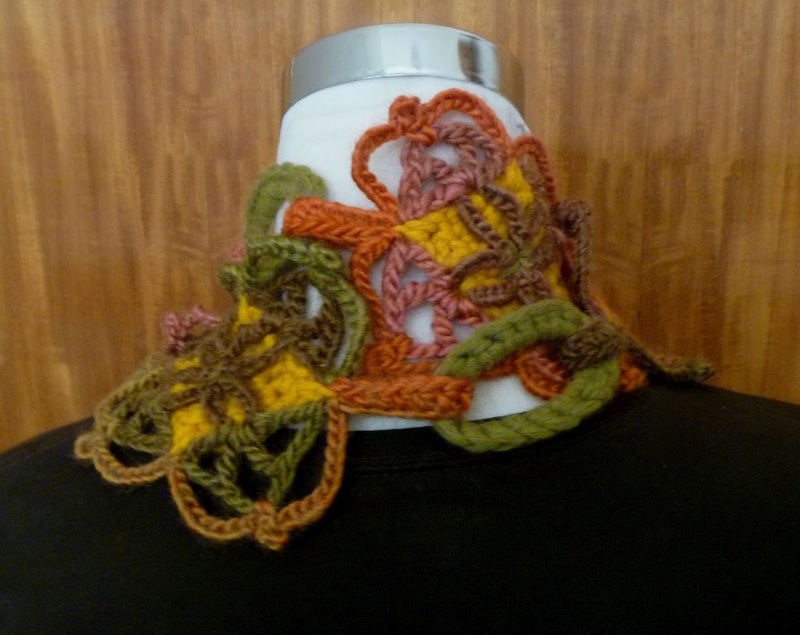 I love the ideas you have, and the skillful way you translate them into beautiful crocheted accessories. You have a wonderful blog, and I am glad I happened across it!